There are 22 Memory Care Facilities in the Oakbrook Terrace area, with 1 in Oakbrook Terrace and 21 nearby. The average cost of memory care in Oakbrook Terrace is $6,775 per month. This is higher than the national median of $4,650. Cheaper nearby regions include Lombard with an average starting cost of $5,067. To help you with your search, browse the 25 reviews below for memory care facilities in Oakbrook Terrace. On average, consumers rate memory care in Oakbrook Terrace 4.8 out of 5 stars. Better rated regions include Lombard with an average rating of 5.0 out of 5 stars. Caring.com has helped thousands of families find high-quality senior care. To speak with one of our Family Advisors about memory care options and costs in Oakbrook Terrace, call (855) 863-8283. Oakbrook Terrace is a suburb of Chicago located in DuPage County. Seniors age 65 and over are most vulnerable to Alzheimer's disease and other dementias, and Oakbrook Terrace's population of 2,134 includes 408 people in that age range. In DuPage County, up to 10.4 percent of seniors on Medicaid, including those in Oakbrook Terrace, have been diagnosed with Alzheimer's. There are no memory care facilities located in Oakbrook Terrace, but there are dozens nearby throughout DuPage County. In Oakbrook Terrace and the rest of Illinois, memory care is provided in supportive living facilities. These facilities may be in their own buildings or co-located with assisted living facilities that are licensed to care for those with memory and cognitive challenges. In llinois, retirement income is exempt from income taxes. This might help seniors and their families afford memory care. Oakbrook Terrace has a cost of living index of 122, compared to a national average of 100 and a state average of 102. This is an important consideration for families of seniors who require memory care in the village. In Oakbrook Terrace, about 38 inches of rain falls annually, roughly on par with the national average. The village gets 31 inches of snow, five inches more than the national average. The town experiences seasonal temperature variance, with summer highs hitting 84 degrees and winter lows reaching around 16. Families of seniors in memory care should ensure that staff provides extra blankets and other amenities to keep residents comfortable in chillier temperatures. The air quality in Oakbrook Terrace is 50 compared to the national average or 58. This may be a concern for families of seniors with COPD or chronic respiratory conditions. Memory Care costs in Oakbrook Terrace start around $5,600 per month on average, while the nationwide average cost of memory care is $4,799 per month. It’s important to note that memory care rates in Oakbrook Terrace and the surrounding suburbs can vary widely based on factors such as location, the level of care needed, apartment size and the types of amenities offered at each community. Oakbrook Terrace and the surrounding area are home to numerous government agencies and non-profit organizations offering help for seniors searching for or currently residing in an assisted living community. These organizations can also provide assistance in a number of other eldercare services such as geriatric care management, elder law advice, estate planning, finding home care and health and wellness programs. To see a list of free memory care resources in Oakbrook Terrace, please visit our Assisted Living in Illinois page. 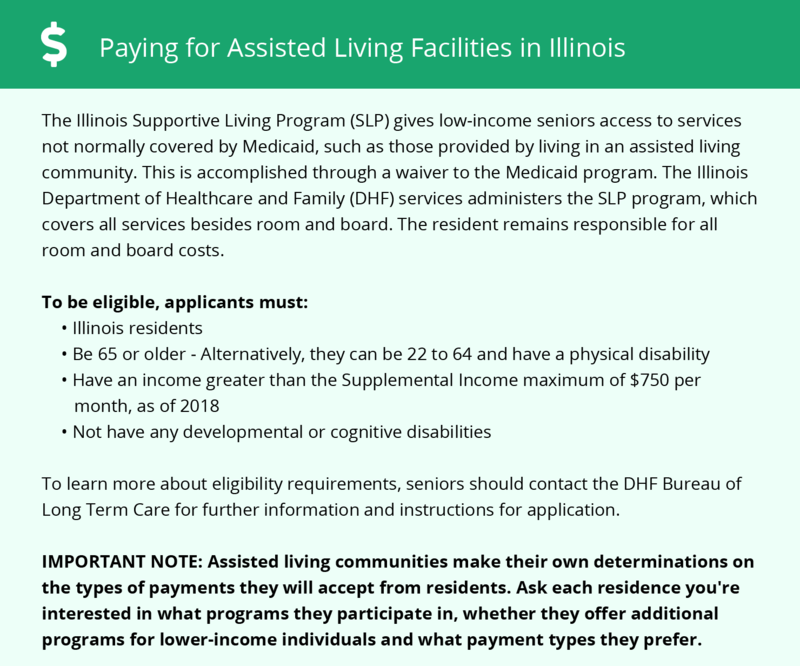 Oakbrook Terrace-area assisted living communities must adhere to the comprehensive set of state laws and regulations that all assisted living communities in Illinois are required to follow. Visit our Memory Care in Illinois page for more information about these laws.